I'd never read any manga, so when I found Mars in my village library, I thought why not give it a try? I had my apprehensions about it at first – the boy in the cover looked completely unappealing, and I wasn't sure about the story. But, it was free, and so home it came! After a very reluctant start, I couldn't help but get drawn in. Sure, it is definitely the most angsty, exaggerated teenage drama I ever remember reading, but something about it really appealed to me. 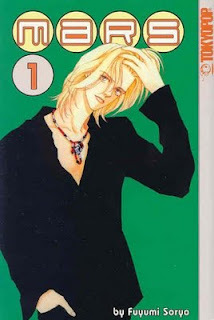 Yup, the boy in the cover looks like he's going to be some kind of clean-cut boyband type, but in actual fact Rei's the 'rebel' of his school – he smokes cigarettes, races motorcycles after school, dates older girls, and lives alone in a rented apartment. Kira, on the other hand, is incredibly introverted and only ever speaks when completely necessary, choosing to focus her energy on her artwork. Eventually they grow increasingly intrigued and attracted to each other, much to the chagrin of their judgemental classmates. And as you can expect, jealously follows them causing drama of soap-opera proportions to ensue! So although completely over-the-top, I really liked it. The illustrations are great, and I loved the whole inevitable Japanese cultural feel. I sure hope the library can get volume 2 for me, because I'd love to see what happens next! I'll definitely be reading more manga now.